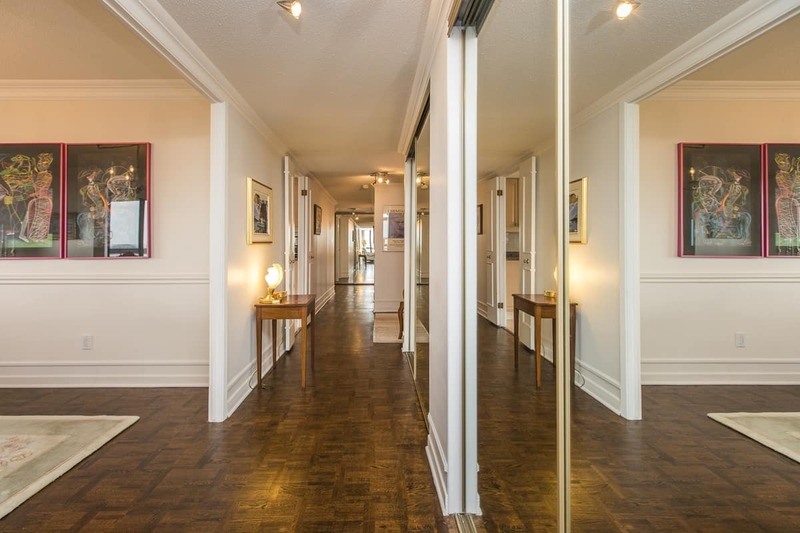 Long one of Ottawa’s prime condo addresses and for good reason. It’s ideally located alongside the famous Rideau Canal ( A World Heritage Site) in Ottawa’s Exclusive Golden Triangle Neighbourhood. Whether you’re looking to retire now or soon, or just wanting to plan for it, this may be your perfect choice. And in just few short months you’ll also have the brand new Light Rail station just across the Foot Bridge. With roughly 1600 square feet this home (largest layout) welcomes you in with a large foyer, beautiful hardwood floors leading you into large elegant living and entertaining space. The massive living room/family room and dining room will comfortably accommodate all of your guests or serve as your private refuge when not entertaining. Being a corner unit affords you great views and light in all directions. Click here to view the Photo Gallery or click the Play Button on the Youtube video below. The family room is directly open to the living room but could easily be partitioned giving each their own balcony. You’ll also enjoy lots of space to work in the kitchen (out of site from the dining room), the extra wall of cupboards means you realize more space in this kitchen than in many houses. For casual dining, the eat-in area of the kitchen provides great breezes and views as well. In the summer months move outdoors to enjoy the large balconies, in the winter enjoy watching the skaters and winterlude activities. Bright natural light fills the home all day long – you’ll feel inspired the moment you wake up. Click the Play button on the Youtube Video below to get a good preview of the home. You have two good size bedrooms ( the master easily accommodates a king-size suite) two full baths including the en-suite and the main bath also features a walk-in shower. Condo fee includes your heat, central air and hydro, as well as great amenities including indoor pool – patio/bbq area, new gym, guest suite, party room, billiards etc etc. You’re just across the street from the canal and a short walk to everything downtown: Parliament, the Famous Byward Market, Elgin Shops and restaurants, The National Arts Centre, across the foot bridge from Ottawa University, and the Conference Centre and the Rideau Centre – soon steps from the new Light Rail station. (Just across the walking bridge). You’ll be hard pressed to find a location as nice as this. Click on the attachments below to view the Property details such as room size and property taxes and floorplan. Call Eric Manherz at 613-601-6404 today for your private viewing!